The Personal Genetics Education Project (pgEd), where I currently work, strives to broaden the conversations about genetics and facilitate dialogue between scientists and communities. As the director of new initiatives at pgEd, I take on a variety of projects in the space of science education, communication, and policy. In this post, I hope to tell you a little more about how I ended up at pgEd, what I do there, and how you can set yourself on a path towards a similar position. pgEd, based at the Department of Genetics of Harvard Medical School, has a mission of raising awareness and starting conversations about both the benefits as well as the personal, social and ethical implications of genetics. In these conversations, pgEd strives to be inclusive of all voices, regardless of socioeconomic or educational background, cultural or religious affiliation, and ethnic or personal identity. We do this through a variety of activities, including creating educational materials and lesson plans that are made freely available online; running professional development (PD) workshops for teachers; organizing Congressional briefings in Washington DC; convening meetings of experts and leaders from academia, industry, community, education and government; advising writers and directors in Hollywood; and working directly with community organizations, libraries, youth groups, and faith institutions. The conversations often move quickly into sensitive topics and uncomfortable places, from sticky ethical dilemmas to dark episodes in the history of eugenics and research misconduct. Past ethical breaches such as the Tuskegee syphilis experiment, the case of Henrietta Lacks, the Havasupai incident, and the sterilization of women in marginalized communities have created a legacy of distrust between these communities and the biomedical establishment. This, along with concerns about the use of DNA by law enforcement, continues to hamper efforts to engage these communities, including those by researchers hoping to increase community participation in new precision medicine research. A willingness to confront these tough issues is essential for building a rapport with these communities, which is in turn crucial if we want to make sure that everyone can be informed and empowered to make their own decisions about genetics, both as individual consumers of technologies and as societal participants in the political process. I have always been very interested in the societal aspects of science, even while I was a bench scientist completing my graduate studies in molecular biology and epigenetics. So, I sought out a number of different opportunities to broaden my training beyond the biological sciences, as well as to acquire leadership and communication experience. These included taking extra coursework and attending seminars in bioethics, public health, science policy, and science and technology studies (STS). I also worked with a number of organizations in public engagement efforts, including giving public lectures, writing science articles for a lay readership, and working with middle and high school students. One of these organizations was pgEd. After obtaining my PhD and working in digital academic publishing for a year, I’ve since returned to pgEd as a full-time staff member for the past three years. pgEd is a small team comprised of individuals from diverse backgrounds and disciplines, and everyone on staff takes on a variety of projects. With our focus on engaging the community and facilitating dialogue, a major part of our everyday work is to liaise with different organizations and individuals, to identify ways of collaborating, and to organize events that bring different voices together to talk about genetics. In addition to events that we put on, we are often invited to present our materials or speak about our experiences in a variety of other settings, including “conventional” academic venues such as scientific, educational or industry conferences, as well as schools, community events, churches or mosques. On occasion, we also get interviewed for print media, radio and TV. Additionally, my current role entails a lot of researching and writing – following the latest developments in genetics research, their applications and regulatory policies; keeping tabs on the conversation about genetics in the media (both traditional and social); and synthesizing and translating all these into social media and blog posts, lesson plans, or information briefs for policymakers. The rapidly changing landscape of genetics and our consistent stream of events mean that there is never a dull day in the office. 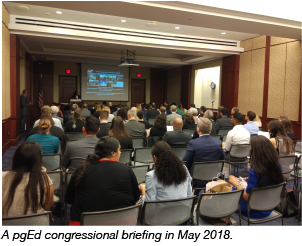 And in the run-up to a major event, such as a Congressional briefing or PD workshop, it is often “all hands on deck” to take care of the organizational logistics. A career in science communication or policy requires broad interest in issues at the interface of science and society, and an ability to talk about science in a language that can be understood by those who are not experts in particular scientific fields. As scientists, many of us are used to being very focused on narrowly-defined research questions in our field of interest. We often communicate in very technical and jargon-filled language in academic writing and presentations. But for many people who don’t work in these fields of research, what often concerns them the most about research is its implications for their lives, their health, their jobs and those of their families. Having a broad interest and awareness of issues outside of your field of research will allow you to better engage these diverse audiences and to identify issues or topics that are matters of concern for them. Researchers currently in academia who are interested in such careers should take advantage of their academic environment and attend seminars, symposia, or courses in social, health or policy-related topics, as time permits. Also seek out opportunities to communicate science to non-technical audiences. Many universities or cities have organizations (often volunteer-based) that put on public lectures, science cafés or science festivals, and getting experience in either giving or running these events will be important both in preparing you for future work in these areas, and in helping you decide whether you enjoy this kind of work. It is also beneficial to hone your non-technical writing skills by writing for science-outreach organizations or student publications, submitting op-eds to your local newspapers, or starting your own blog. Even if you do not end up pursuing a career in science communication or policy, being able to communicate your work to a non-technical audience is an important skill for every scientist. After all, scientific research does not happen in a vacuum that is isolated from the rest of society or devoid of social context. This “general public” audience comprises the taxpayers who fund much of scientific research and who will be affected by the knowledge and applications generated from this research. At both a practical and ethical level, scientists arguably have a duty to engage the public on the implications of their work. Johnny Kung is the Director of New Initiatives for the Personal Genetics Education Project (pgEd). He is broadly interested in the legal, ethical and policy issues at the interface of biology and society.